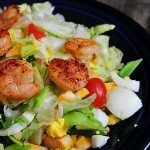 Lettuce Wraps make a delicious quick lunch or supper that I turn to time and again and these Cobb Salad Lettuce Wraps are an absolute favorite of mine. 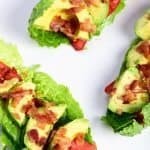 While I absolutely love cobb salads, there is just something about these lettuce wraps that I love even more, if that is possible. Maybe it is the sheer convenience that lettuce wraps give you of having all of your favorite ingredients right there in your hand. Kind of like a sandwich, but even better in my opinion. For my lettuce wraps, I like to use large, unblemished leaves from a head of butter lettuce or even iceberg. They hold together well and compliment just about any ingredients you can imagine. But of course, you can use romaine if you’d like. You’ll just want to make sure you keep the ingredients you use for your lettuce wraps chopped rather small to fit inside easily. Okay, so back to the recipe at hand. 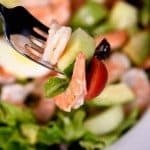 The way I can remember the classic ingredients of a cobb salad is from the mnenomic: EAT COBB. A waiter at the Brown Derby in Disney taught it to me years ago and it is one thing I’ve remembered. Crazy how I can remember that, but can’t remember to fold the towels in the dryer. Anyway, it stands for: egg, avocado, tomato, chicken, onion, bacon, blue cheese. I think you can take a few liberties when making it to make sure it includes exactly what your family enjoys though. For instance, my son is not a fan of blue cheese so they were decidedly omitted in my lettuce wraps photographed. 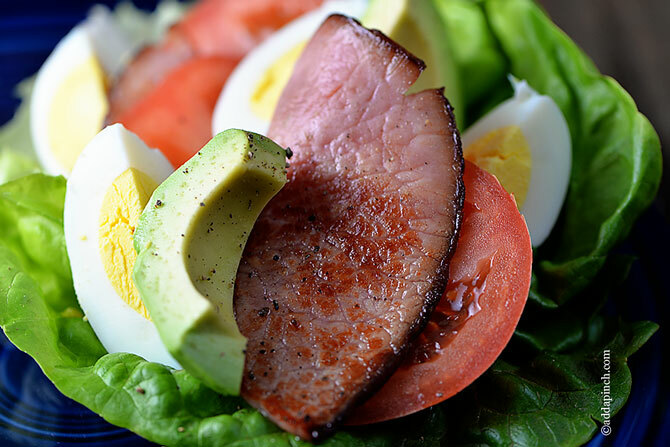 If your are a cobb salad purist, please forgive me. Just pretend you see little crumbles of blue cheese if you don’t mind. I also took a liberty and used Canadian bacon in these lettuce wraps. It worked like a charm. Of course, thick-sliced, applewood smoked bacon cooked crispy in the oven is scrumptious, too. I just used what caught my eye. Lettuce wraps make a favorite quick-fix lunch or supper. 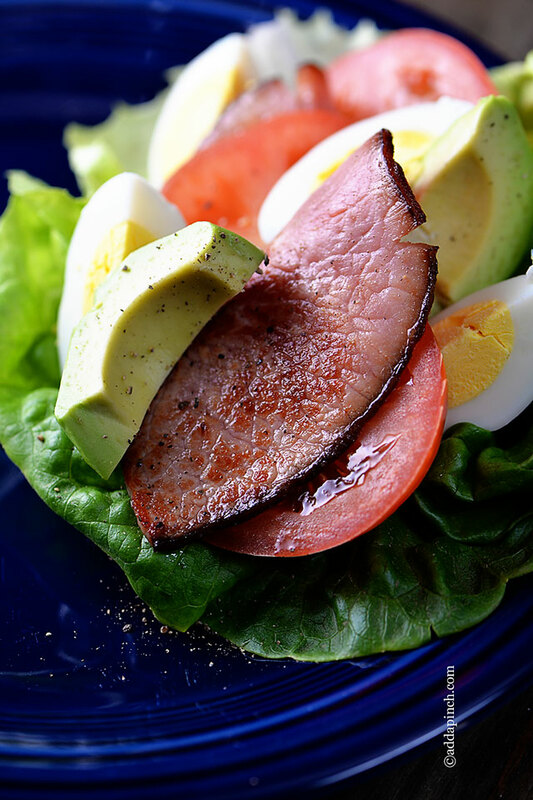 These cobb salad lettuce wraps are sure to become a favorite. Wash lettuce leaves and blot dry with paper towels. 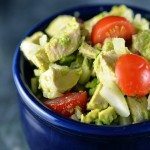 Place lettuce leaves flat on a plate and layer with eggs, avocado, tomato, chicken slices, onion, and bacon. Top with blue cheese crumbles and drizzle with red wine vinaigrette. 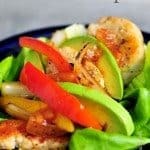 Here’s my Cobb Salad Lettuce Wraps recipe. I hope you love them as much as I do! I haven’t visited your blog in a little while. I come back and you leave me gasping for breath. These look A-MAZING! You rock! What a great idea. Perfect for a light lunch or dinner. This looks like something my family would love!! 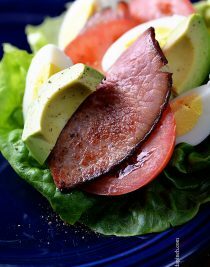 I love the eggs and avocado and they would love the meat! 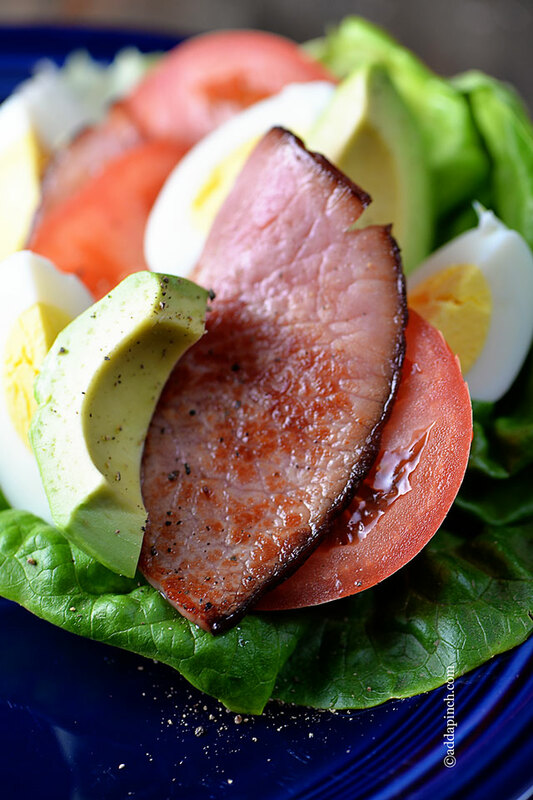 Being able to wrap my Cobb salad up in my hand is a great idea! 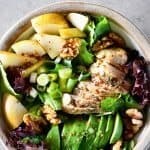 Wonderful lunch idea! Thanks!